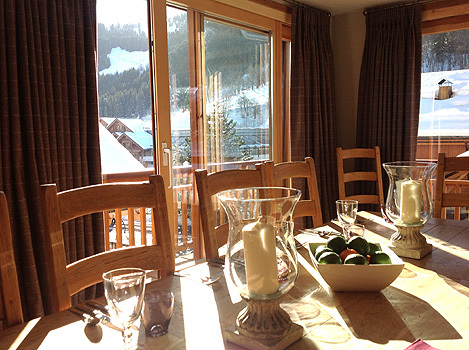 Chalet La Montee is ideally situated only a few minutes’ walk from the main Chaudanne lifts and ski schools, as well as the shops and restaurants in Meribel centre. 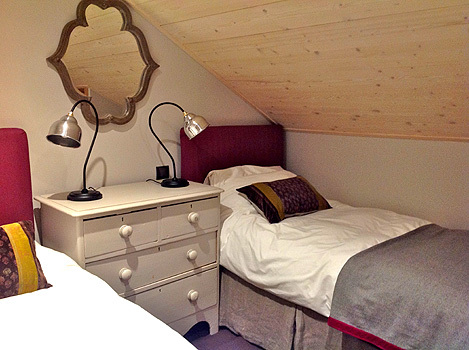 The chalet has been completely refurbished and now comfortably sleeps 12 with 6 bedrooms and 5 luxury bathrooms over three floors. The interior designed sitting and dining area is open planned with a log fire and large doors to the balcony providing stunning mountain views. 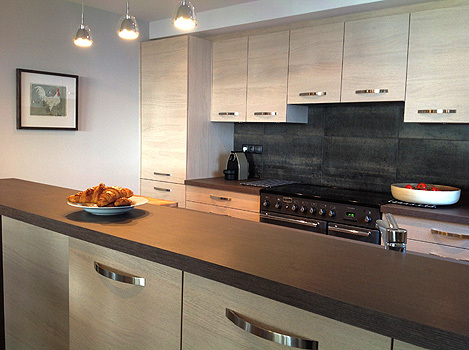 The large kitchen is fully fitted and equipped with a double oven range cooker for you or (your chef) to cater as grandly or simply as you wish. 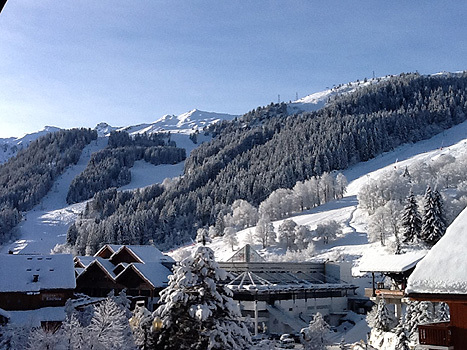 Three supermarkets and various specialist food shops are within easy walking distance of the chalet. Alternatively, you are within minutes of most of Meribel’s restaurants if you would rather eat out. On the ground floor is a TV room with satellite TV, a ski room with boot heaters as well as a laundry . There is parking for one car outside the chalet. Please note: smoking is not permitted in this chalet. Tourist Tax is payable in the resort at the rate of 2.53 €uros per person per night for anyone 18 years old or older. 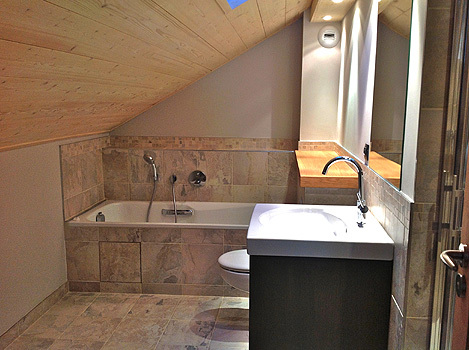 with ensuite bathroom and shower. We had a wonderful stay at Chalet La Montee. 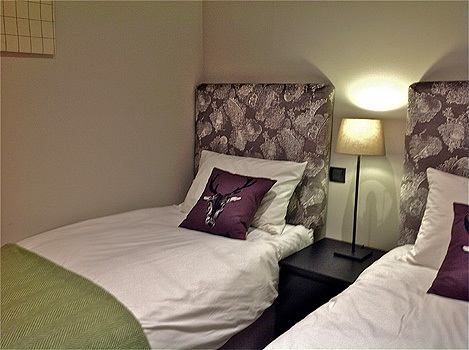 It is in a superb location that suited our needs perfectly, nicely decorated and very well equipped. We would very much like to book it again for some time next season. 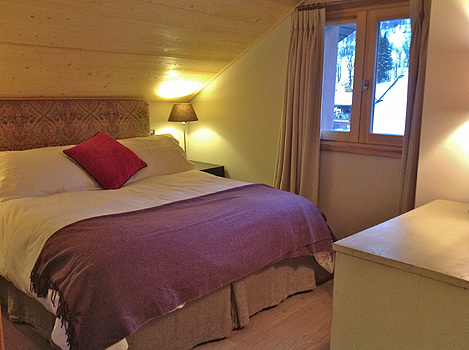 The owners had thought of everything needed in a skiing chalet to make it the most comfortable Chalet I have stayed in and it was the most perfect Chalet for a family of mixed ages from 7 - 70! From the deliciously comfortable beds, to ones's Ski Boots being warm and dry in the morning and the wonderful large living area, made it impossible not to have a very happy family holiday. Thank you for making out stay in Meribel so stress-free and comfortable. Despite the lack of snow, we were thrilled with our accommodation - for position and comfort. We would highly recommend Chalet La Montee (or perhaps not in case we miss out ourselves next time!!!). We had a very happy and memorable time in Meribel. Wishing you a very Happy Christmas and a bright start to the New Year. great service. The whole family had a fantastic time. For some it was their inaugural ski trip and I must say they've got the bug! The chalet was excellent and in a great spot. again and roll on next season!! Thankyou so much for organising the Chalet in Meribel for me. The owners had thought of everything needed in a skiing chalet to make it the most comfortable Chalet I have stayed in and it was the most perfect Chalet for a family of mixed ages from 7 - 70! Add to the equation the Chalet being so close to the ski-lifts and ski schools meeting area, makes the Chalet definitely 5 Star! Congratulations to it's owners in making it such a gem. You may have heard that we had a bit of a struggle getting up to Meribel because of the snow dump, forcing us to stay the night in Geneva at the Novatel, but it was worth it for the wonderful week we had of good snow and sun!